Note: this article was published originally as the 6th chapter in my Relearning MSX series. We don't care about the CD-ROM drive, but we'll leave it in case we need it for something else in the future. We just have to keep in mind that it's there, because in this post we'll be copying files from the FS-A1GT's floppy drive and we'll need to know what drive letters are assigned to each device. Another thing that you need to take into account is that we need to format the hard drive partitions. If you were following the instructions in the previous post and created them using the diskmanipulator command, then openMSX already did this for you and you're good to go. If you're doing this on a real MSX then probably there's an utility that you need to run to create and format the disk partitions. Check your interface's documentation for this, because different interfaces use different tools. Let's continue where we left it in the previous post. As I explained in the first chapter of this series, MSX-DOS2 consists of both a hardware part (a cartridge containing a ROM), and a couple of files on a floppy disk: COMMAND2.COM and MSXDOS2.SYS. Please note that you only need one of these disks. The English version will set the display to text mode and will show English messages. The Japanese version displays Japanese messages, but it runs in one of the graphics modes. Because of this, when the text in the screen scrolls up the screen redraws will be slow. I recommend the English version. Next, create a folder somewhere in your computer to save all the MSX disk images we will use. I like to keep mine under ~/.openMSX/Disks (I'm using a Mac), but feel free to use any location you want. From now I will refer to this folder as the Disks folder. Go ahead and move the MSXDOS2E.DSK (or MSXDOS2J.DSK) to the Disks folder. Next, start openMSX if it wasn't running already. Remember the command line from the previous chapter if you're on a Mac! You should see the MSX BASIC screen again. We need to insert the MSX-DOS2 disk image into the MSX in order to copy the operating system files. From the openMSX menu (CMD+O on a Mac, Menu key on Windows), choose Insert Disk... (drive A), navigate to your Disks folder and choose the MSX-DOS2 disk image. What the f... happened here? The File not found error message is telling us that there are no files in the disk. How can that be? Remember that at the beginning of this post I said that we have to keep in mind that we have a virtual CD-ROM? Well, this is why. What's happening here is that the emulated MSX is booting from the first drive available (the first partition of the hard disk image), and that disk doesn't contain any files. 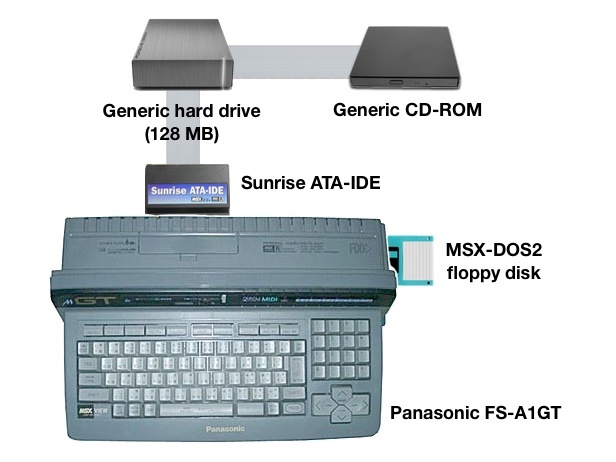 On an MSX, disk drives use letters, in exactly the same way as MS-DOS or Windows. 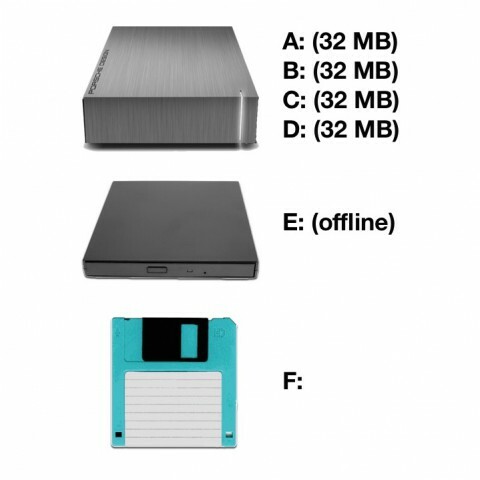 Usually, the first two drive letters (A: and B:) are in use by the computer's floppy disk drive(s). However, an MSX can only boot from drive A:, and this is why the Sunrise ATA-IDE interface (and other hard disk interfaces) enumerate the hard drive partitions first, leaving the floppy disk drive(s) last. The drives A:, B:, C: and D: are the four partitions in the hard disk image, E: is the CD-ROM, and F: is the floppy disk drive. It worked! We can see the MSX-DOS2 files in the disk: MSXDOS2.SYS, COMMAND2.COM, a couple of .BAT files, and also two directories, UTILS and HELP, though MSX BASIC isn't very helpful and those two directories look exactly the same as regular files. You can see that I'm typing the commands in uppercase, but this is just a matter of style to make the screenshots look cool. MSX BASIC doesn't care whether you run commands in lower or upper case. Now we're already running under MSX-DOS2. However, we still need to copy a few more files from the floppy disk. Remember that there were a couple of directories (UTILS and HELP). UTILS contains a few external commands, and HELP contains help files for MSX-DOS2 commands. Note: the ¥ (yen) character is the same thing as the backslash character (\) on your keyboard. This is because Japanese keyboards use the yen symbol instead of the backslash. If you hadn't noticed, the FS-A1GT's keyboard is in Japanese. AUTOEXEC.BAT prepares a RAM disk and copies COMMAND2.COM there. The RAM disk becomes drive H:, and is much faster than the hard drive. REBOOT.BAT tells MSX-DOS2 to use H: for temporary data, and also to use the copy of COMMAND2.COM stored H: to make the system run faster. Finally, it sets the PATH environment variable to A:¥UTILS so the computer will find the external commands stored there. Congratulations, MSX-DOS2 is installed. Reset your MSX (or the emulated one). If you downloaded the Japanese version of the MSX-DOS2 floppy then these documents, and all status and error messages will be in Japanese. That's it for now. In the following posts we'll install MSX-DOS2 TOOLS, then MSX-C v1.2. Where is the next post? This is sooooo slow! Wow. Great post ! Great environment ! Great explanation ! uh, producing that ¥ seems to be a bit cumbersome, could not get it without on-screen-keyboard..
On Japanese computers the \ is replaced by ¥, but it's only the character pattern that has changed. There is an executable for DOS (can't recall the exact name now) that replaces ¥ with \ - at least until you execute the MODE command. That helps a bit for us which are not used with Japanese characters. I myself hacked the rom file to make it permanent. It is fairly easy and solves for emulation, but if you use a real Japanese machine, replacing the ROM is not that straight forward. Ah yeah, a fairly simple yet effective little thing. It doesn't take much time to rewrite that thing if necessary. I'm using windows 10, OpenMSX and executing OpenMSX in administrator mode. Can you/anyone tell me whats wrong? I solved my problem using administrator privileges when starting OpenMsx an giving all permissions to the files. It's not recemended but it works. bind F6 "keymatrixdown 1 0x10"
bind F6,release "keymatrixup 1 0x10"
I'd like to help improving this excellente tutorial. When I turn off the system, the files from A: seem to be gone.